Get stunning, panoramic views over Zimbabwe’s most celebrated natural landmarks—without moving a muscle. 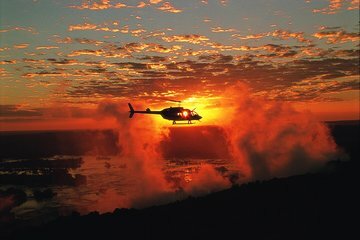 Soar over Victoria Falls, Batoka Gorge, and the wildlife-filled National Park by helicopter, covering three world-class attractions in one unforgettable ride. Ideal for travelers short on time, you’ll cover all the top sights in under thirty minutes, with the chance to spot elephants, giraffes, hippos, and much more. Times: 07h30 am to 13h00 and 14h00 to 16h30 - every half hour. Due to comfort and weight / balance of the aircraft, passengers weighing over 120kg may not part take in this activity.